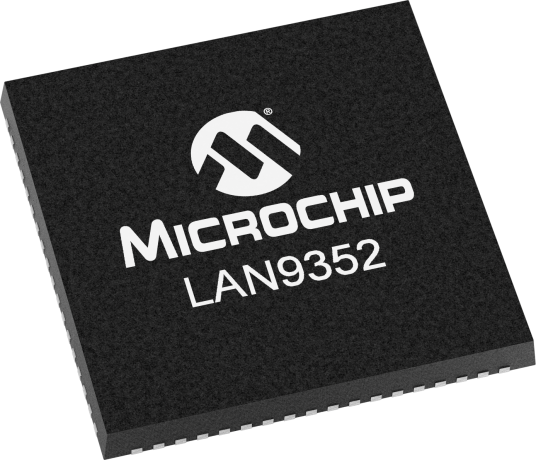 Microchip's LAN9352/LAN9352i is a high-performance, small-footprint, full-featured 2-port managed Ethernet switch. This device is application-optimized for consumer, embedded and Industrial designs which require a highly integrated, cost effective device with switching functionality, flexibility and ease of integration. SQI Interface .The Host MAC incorporates the essential protocol requirements for operating an Ethernet/IEEE 802.3-compliant node and provides an interface between the Host Bus Interface (HBI) and the Ethernet PHYs and Switch Fabric. The device communicates with the microcontroller through an SRAM-like slave interface. The simple, yet highly functional host bus interface provides a glue-less connection to most common 8 or 16-bit microprocessors and microcontrollers as well as 32-bit microprocessors with an 8 or 16-bit external bus. Alternatively, the device can be accessed via SPI/SQI . The Host MAC interfaces with the 10/100 Ethernet PHY’s (Virtual PHY, Port 1 PHY, Port 2 PHY) via an internal SMI (Serial Management Interface) bus . IEEE 1588-2008 is supported via the integrated IEEE 1588-2008 hardware time stamp unit, which supports end-to-end and peer-to-peer transparent clocks. The LAN9352 complies with the IEEE 802.3 (full/half-duplex 10BASE-T and 100BASE-TX) Ethernet protocol, IEEE 802.3az Energy Efficient Ethernet (EEE) (100Mbps only), and 802.1D/802.1Q network management protocol specifications, enabling compatibility with industry standard Ethernet and Fast Ethernet applications. 100BASE-FX is supported via an external fiber transceiver. Microchip's complimentary and confidential LANCheck® online design review service is available for customers who have selected our products for their application design-in*. *The LANCheck online design review service is subject to Microchip's Program Terms and Conditions and requires a myMicrochip account.